In the post-mortem of Donald Trump’s election, I noted how for folks involved in activism, not much was going to change. The hard work of organizing, regardless of who became president, was going to continue. If my memory serves me well, I wrote that under Trump, the primary difference for organizers would be that the uphill path would become more steep than had Hillary Clinton won the election. 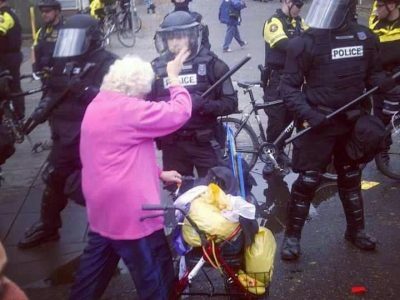 Organizing for greater justice, no matter at what level, is a matter of ascension. A year following Trump’s inauguration, it seems more people are getting involved in fighting for that nebulous phrase, a more just world. 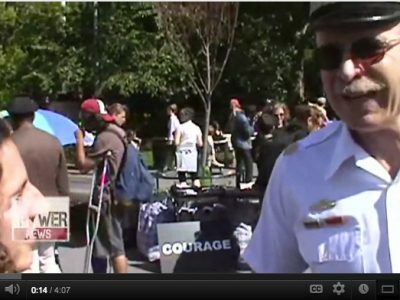 One of the most invigorating groups we have written about in the pages of the Portland Occupier has been the Burgerville Workers Union (BVWU) which was formed over a year and a half ago to give the 1,300 employees at Burgerville’s 47 locations in Oregon and Washington a voice in their workplace. It has been an uphill climb, but it has been successful, if slowly so. 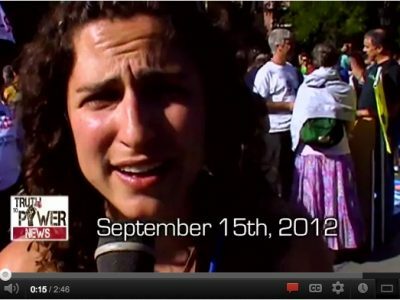 The campaign has included all the usual aspects of organizing. There is the typically constant education of both Burgerville’s workers and the public that cuts through Burgerville corporate’s propaganda. 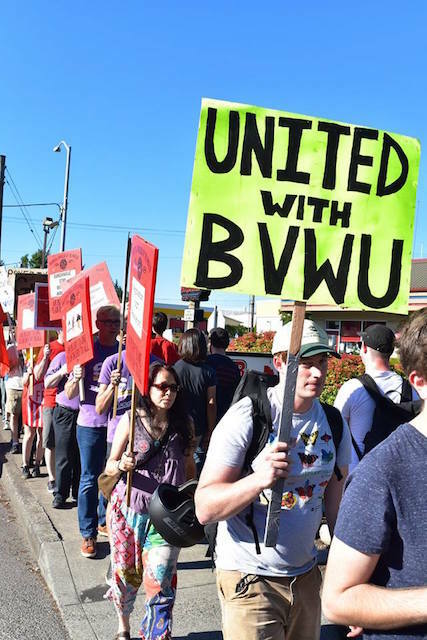 The BVWU has reached out to other workers and groups, fostering solidarity with, among others, Carpenters, Longshoremen, the Community Alliance of Tenants, and the workers at New Seasons who are currently forming a union. Their actions have been creative and disruptive, leaving stores virtually empty of customers. The long and intense hours of planning required for such actions are reflected not just in all those empty seats and booths, but in the swelling numbers of people who support the union. For people who are not used to activism and for whom the history of its gains is limited to lessons learned in a high school history text, the victories seem to come slowly. That’s fair enough: those textbooks rarely give adequate space to movements and their “small” victories over long time frames, favoring the more spectacular, singular great moments and individuals. 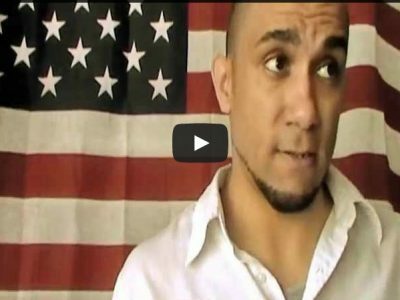 At the expense of slaves who resisted their masters and the numerous abolitionists who for years fought against chattel slavery, the story of those slaves gaining their freedom mostly comes down to Abraham Lincoln and the Civil War. The Civil Rights Movement becomes Martin Luther King–notably not the Martin Luther King who in his later years sharply critiqued capitalism and the US imperialism and domestic terrorism that resulted from it–and the Civil Rights Act. You, me, and most of the people we know who are involved in movements for greater justice are, at least in those textbooks, thrown under the rug for the sake of ease and simplicity. I am a firm believer that any victory is a huge victory. I have seen how long even the seemingly smallest of those victories can take, and I have seen how much hard work goes into them. It took much rethinking–relearning, in a way–for me to arrive at that thought, much as it did when I concluded that any action was great that saw one more person than me attend it. You don’t win with a singular strike. You win through a long, sustained, and committed fight. “It is common knowledge that closing conditions at BV 14 are horrendous. On top of issues of understaffing and little to no training available for new hires, closers often get out after 3 a.m., have to handle dangerous chemicals and face increased likelihood for serious burns. Workers, especially women closers, have had to face the choice of walking 4+ miles home late at night or losing more than an hour’s worth of wages on taxis. It is no wonder why of the 70 people hired at BV 14 this year only around 20 have stayed: workers refuse to work for a company that treats us as if we are disposable and our safety irrelevant! This is not the stuff of textbooks. There are no Great Men, although there are certainly people of greatness who have come together in solidarity to be greater as a whole. There is, perhaps, a Great Event up ahead, but if and when that happens–that is, when the BVWU is finally recognized–I suspect it will not grace the front page of the New York Times or be the lead story on CNN. A few days later, another BVWU item came over my feed. It too lacked requisite textbook Greatness, even as it was great. It bears repeating that these are, however unacknowledged by those with power, huge victories, and upon them the Burgerville workers will build more huge victories. There is no way around how this is done, and there are no shortcuts. The work is frequently boring, and it is surely as often grueling. It is long haul stuff, and it requires people to see themselves as links in a chain, or to use Martin Luther King’s famous line, points along the arc of history bending toward justice. It requires commitment, often through tough times that are at least just as numerous as the great victories that rise from those difficult ashes. A few days after the BVWU’s great victories, on a Friday morning, I saw a reposting of something from Twitter dealing with Special Counsel Robert Mueller’s investigation of the Trump Administration. At the time, there were rumors circulating that Trump would fire Mueller because he was getting close to some ugly truths surrounding Trump and his election. The Twitter poster instructed his many readers that if Trump fired Mueller over the weekend, there should be a general strike on Monday. Please, dear reader, ingest the immediate above paragraph again. Now, please consider the prior paragraphs dealing with the BVWU. 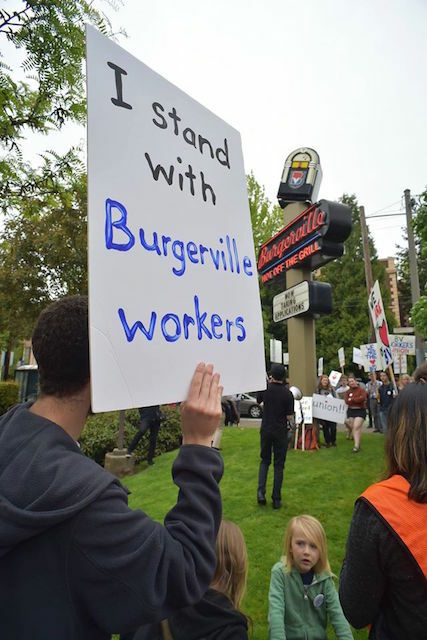 It took the Burgerville workers about 18 months to make those gains at those stores–even more if you include the months of planning prior to the union’s coming out party in April, 2016. Those gains were not given to them. 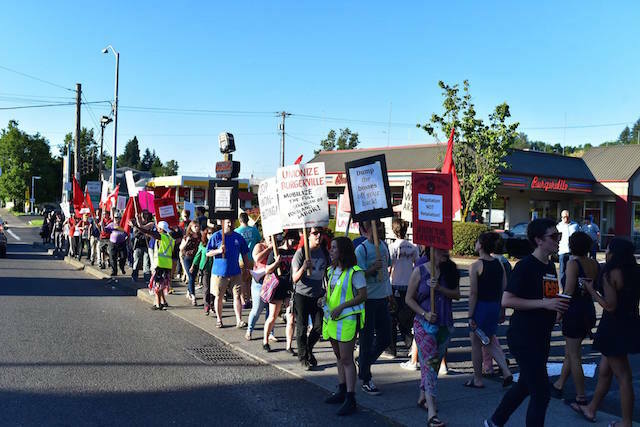 The workers demanded them, and they were able to do so because over those 18 months, the union created the conditions which forced Burgerville management to concede. Soon after that Twitter comment, I was talking with Luis Brennan of the BVWU and noted the disparity between it and the work of the union. He laughed, noting how he would love to see a general strike, but expressing doubt that it could be organized in 48 to 72 hours. Which is not to say it is not doable. But any organizing, whether among fast food workers fighting for dignity on the job, tenants demanding more rights, or people of diverse gender identities and sexual orientations, and people of color, insisting they be treated as fully human, currently requires much more work than simply issuing a plea on social media. Years ago I saw a documentary about Harry Bridges, the founder of the International Longshore and Warehouse Union (ILWU). In a piece of footage from around 1977, Bridges was asked what it would take to get a single payer health insurance system in the US. He answered that the solution was actually quite simple: don’t go to work on Monday. Don’t go on Tuesday. By Wednesday, you will have single payer health insurance as the law of the land, making sure everyone can get healthcare. Bridges clearly understood that while a general strike was not so easily accomplished, once people had been adequately organized, it would be as simple as a few phone calls–or a Twitter message–for their demands to be met. While that point is far away, the path to it is clear. It is the same path it has always been: organize, organize, organize. As we noted a year ago in these pages, your problem is not going to be finding a group organizing around an issue important to you. Rather, your difficulty will be deciding upon which issues you will focus, and with which of the many groups organizing around that issue you will work, regardless of who is in the White House. For a bonus, you will find yourself surrounded by good people who will constantly serve to remind you that you are not alone. One year later, there still is no better time to get started than Now. Thanks to Jodi Darby for her help on this article.